What Will Your Emergency Visit Be Like? We’re available 7 days a week, so you can call us anytime. If it’s late at night, leave a message and we’ll get back to you the very first thing the following morning. A visual exam – Then we’ll visually inspect your teeth and gums to get a general idea of what’s going on and how to proceed. X-rays – X-rays allow us to see what’s happening inside the jawbone and the roots and nerves of your teeth. They’re also necessary to see if there’s an infection present that needs to be addressed. Photographs – In some cases, we’ll use a small intraoral camera to take up-close photographs of your teeth. This not only documents any damage in your mouth, but also helps you better understand your treatment recommendations. Recommendations and treatment – Lastly, using all the information we’ve gathered during the exam, we’ll tell you what we found, explain your diagnosis, and recommend the best treatment. Prescription for antibiotics (if you have an infection) – In many cases, a toothache or facial swelling is a sign of an infection. This can be dangerous or even life-threatening if it goes untreated, so, if necessary, we’ll prescribe antibiotics right away before treating your tooth itself. Broken tooth or filling – A broken tooth or filling can usually be repaired with either a filling or dental crown, but if the nerve has been damaged, a root canal may also be necessary. Severely broken teeth may need to be extracted. Toothache – Once an infection has either been ruled out or treated with antibiotics, you may need a filling or a dental crown. 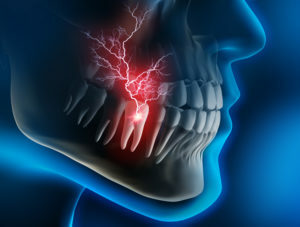 Again, if the nerve of the tooth has been affected, a root canal may be necessary to save it. Knocked-out tooth – It’s important that you’re seen soon, preferably within an hour, and that you handle the tooth correctly (only touching the crown, not the root, gently rinsing the tooth off, and either putting it back in its socket or in a glass of water or milk). We’ll always try to save your tooth, but if that’s not possible, we’ll clean the area and stop any bleeding. After you’ve healed you can return to discuss replacement options. An unexpected trip to the dentist is never ideal. But, with the weekend hours that Canyon Creek Family Dentistry offers, you’ll be out of pain quickly and get the care you need to have a healthy smile in the future! Dr. Afshin Azmoodeh is a general and emergency dentist in Richardson with nearly 20 years of experience and a graduate of the Texas A&M College of Dentistry. As part of his dedication to emergency care, he provides high-quality dentistry 7 days a week to accommodate his patients in any situation. If you have a dental emergency and have any questions, he can be reached via his website.